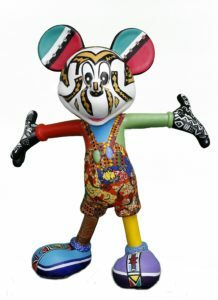 Disney Africa, in association with Art Eye Gallery, launched the Mickey the True Original Art Collaboration where ten six-foot Mickey Statues were unveiled, each brought to life by ten highly talented South African artists. Each statue has been designed, painted and crafted to show each artist’s unique take on Mickey Mouse, who is celebrating his 90th anniversary this year. From vivid colour palettes, spray paint graffiti stylings, to pantsula outfits and shweshwe prints, each interpretation is a celebration of the global icon in a truly proud South African way. The ten artists include Cassius Khumalo, Colbert Mashile, Dominic Tshabangu, Lee Scott Hempson, Louis van den Heever, Nika Mtwana, Phumzile Buthelezi, Toni Bico, Trevor Coleman and Welcome Danca. Fans were able to see the statues in real life as they travelled the country as part of the Mickey the True Original South African Exhibition. The exhibition travelled to Sandon City, Centre Court, the Gateway Theatre of Shopping Expo Explore Court and finished its journey in the Canal Walk Shopping Centre, Centre Court. Featuring 4 sections highlighting Mickey’s innovation, his evolution, influence on fashion and also pop culture, the exhibition is in collaboration with Samsung and Edgars to delight fans and families alike as they journey with Mickey over the years. South African fans are encouraged to share their own Mickey Mouse moments, inspirations and more on social media using the hashtag #Mickey90Africa.